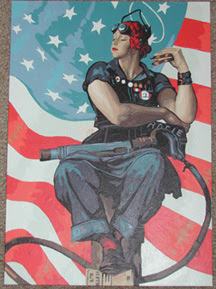 I like Rosie the Riveter. I found this paint-by-number kit at a hobby shop back in Flint, Michigan. I had to have her. I painted her up (and some of the numbers on the board were labeled wrong so it was like hard work–hee!–and she now sits in my cube at work, looking me over and finding me slightly less cool than her liberty-driven mission. I edit naughty books and she made planes to fight the Nazis. She’s got it all over me.